May 22nd, 2018---: Took an extended break from this blog, so hence why there were no "2017" updates. But, the events of May 15th of this year I felt were worthy of an update, so here it goes! A rare combination of ingredients came together over the Lower Hudson Valley of New York State on May 15th, and since Dave and I were still here in the area, as Tornado Alley has been quiet so far this season, we decided to give it a go and chase. The thing that jumped out at us the most were the very steep mid-level lapse rates for this part of the country. Lapse rates approaching 8.5C isn't something that happens around here all too often. That along with the combination of good speed/directional shear prompted a rare Moderate Risk 10% Tornado from the Storm Prediction Center. I headed up to meet Dave at his house near Poughkeepsie, NY and by the time we met up, storms were already getting their act together north of us by about 30 miles. And these weren't your usual multi-cellular storms that are most common here in the northeast, these were legit supercell thunderstorms. We decided to pull off the Taconic State Parkway at the Gallitin Overlook about 20 miles east of Saugerties, NY and await the storm to our west. Visibilty is very limited in NY State, so when we found a scenic overlook in the path of the storm, we felt that was our best option. It wasn't long before the lightning began to pick up, and a visible wall cloud came into view just to our west. We both felt that hail was a good likelyhood, but had no idea how big it would ultimately get. We quickly found out. Once the hail began, it quickly grew in size from quarters, to over golf balls, with some tennis balls in there as well! People began pulling off the Taconic left and right, and many had already lost glass. Several vehicles had shattered windshields and rear windows, and all of them experienced some considerable body damage. Thankfully Dave and I had already installed the hail guards in anticipation for our yearly trip to Tornado Alley, so I did not lose any glass. But, I did receive the first hail dents on my 2013 Xterra! Who knew that the first significant hail damage to my vehicle would be gotten in my home state of NY. Definitely didn't see that coming. 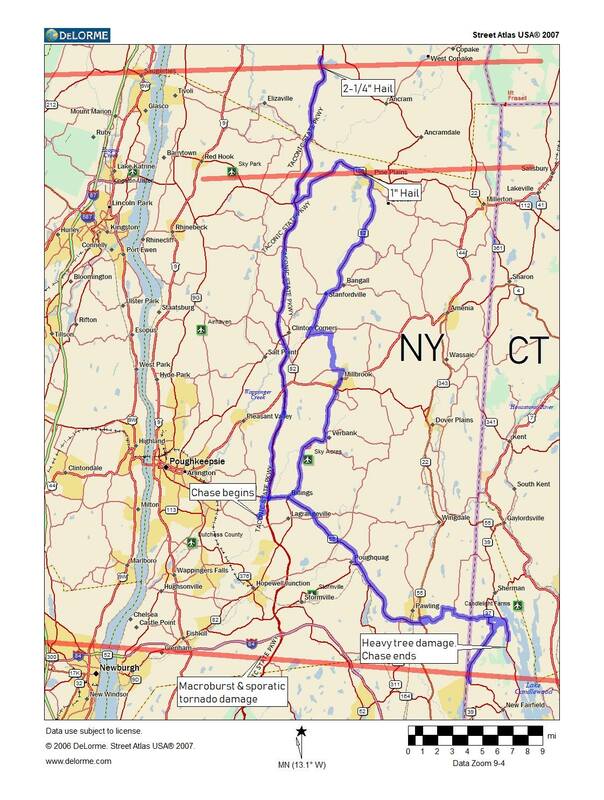 Below is a map showing our route that day starting from Dave's in Poughkeepsie. And below that is the detailed National Weather Service assessments of the days events. Several tornadoes did touch down, but none became visible to us due to the rain wrapped nature of them. After the hail passed, we tracked the storms into northwest Connecticut where we documented extensive tree and power line damage. Definitely a rare day for NY State, but I've noticed that during very quiet years out on the Plains, the northeast has a tendency to be active. We'll see if that trend continues over the coming weeks and months. estimated maximum wind speed of around 75 mph. estimated at 80 to 90 mph. maximum winds of around 115 mph. four miles in length in the Terry Hill area around 429 PM EDT. snapped multiple trees along its path, not all of it continuous. was classified as an EF1 with estimated maximum winds of 100 mph. via wind damage to the roof of a baseball dugout. tornadoes due to their size and scope. tracks and the west side of Route 22.
tornado is classified as an EF1 with maximum winds of 100 mph. is classified as an EF1 with maximum winds of 110 mph. Brook State Park, to just east of Tyler Mill in Wallingford.